CAP Talk | General Discussion | Membership | Topic: [eServices] New CAPWATCH confusion -- restricted app? [eServices] New CAPWATCH confusion -- restricted app? Back before the CAPWATCH overhaul/replacement, It was really useful to me as First Sergeant to be able to use CAPWATCH to track the promotion eligibility dates for the cadets under me, and also to see what promotion requirements the were missing, so I could sit down with them and make a goal and a plan for when they wanted to promote by, and what they needed to do to do that. It would be nice to retain that capability as a FlightCom. Now, however, with the new CAPWATCH, I can get to the download page, but under the organization/unit drop down select, nothing appears. Also, when I try to go to the CAPWATCH documentation, eServices ejects me to the login page. I was really excited to see that they were coming out with an API, but I can't write any sort of program to pull data from it without documentation, and the perms required for access! I had a vision for a fully automated cadet management tool, complete with attendance reporting, with email and SMS, (And potentially ES call down, that would be cool...) in addition to the spreadsheet I already had to track promotions, but at this point I guess the idea is moot. Is CAPWATCH a restricted app now? That would explain things. Or am I just doing something wrong? I guess I could see why they would make it restricted, if cadets were using the data from it irresponsibly. It would be a shame if that was the case, but I guess it could only take one act of stupidity for the powers that be to feel the need to restrict it. Perhaps someone could help set me straight. Re: [eServices] New CAPWATCH confusion -- restricted app? Is CAPWATCH a restricted app now? That’s too bad. Did any specific incident lead to the change? Or is it just an OPSEC thing? In the CAPWATCH module there is a menu option to request CAPWATCH access. Your request goes to your commander who can approve or reject your request. Who can download the data is now more controlled than before, which is a good thing. But the download is still available to anyone who needs it. Or is it just an OPSEC thing? More of a PII thing. I can understand that, and the personal privacy of all members, and especially that of cadet/minor members, must certainly be our paramount concern. While not having universal access for all members is in this case an inconvenience, I have no problem (and, upon new understand of the reasons and procedures, I fully support) going through the required channels to access protected information. Thank you all for your clarification! I went ahead and tried to submit my CAPWATCH request, and it threw me an error, multiple times. "That's odd" I thought. I decided to try it again another day, thinking the system was down or something. I tried it again today, same thing. 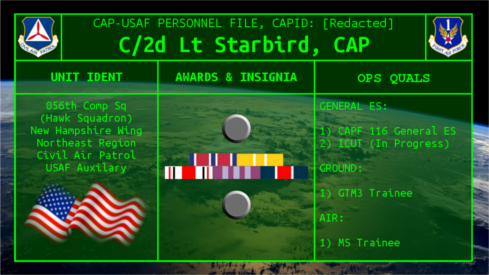 So I went back to the memorandum announcing the new CAPWATCH, and re-read it, and..... *CAPWATCH is now available to senior members only* You know, NHQ, you think you could have just put that on the CAPWATCH page, rather than having me fill out the request several times, each time getting a simple "There was an error processing your request," with not indication that the only "error" involved is the fact that I'm a cadet. -_- Also, if the app is now restricted, you could have put it out of my view with the other restricted programs, instead of this weird semi restricted CAPWATCH homepage that has done nothing but confuse me and waste my time. Gone are the days, it would seem, that cadet staff has the ability to monitor the progression of the cadets under them with ease. None of the other methods are API or data download, meaning that even if I did get access to the restricted cadet promotions report (if cadets even can, these days), that I would have to either do everything manually, or develop some form of web crawler to parse data right out of the eServices GUI, which would no doubt break each and every time something was tweaked by NHQ IT. Also, if the report is a PDF, I can't even parse it. NHQ says they would like everyone to stop using locally devolved systems, but have provided limited to no functionality to replace said local systems (that cadet staff can access, anyway). Our cadet staff at 056 now has no idea where our cadets are at in their progression now, short of asking them each in person. And since they always forget to check themselves between meetings, regardless of the number of emails we send, many of them don't even know what they need to progress, which puts everything at an impasse when cadet staff sits down to try to plan a meeting, and at the actual meeting itself where we then have no idea what to expect. Sorry for the rant, but I'm frustrated with this. I understand the restriction on universal access to CAPWATCH, however, cutting cadet staff out of the system entirely simply puts us in the dark. I'd be fine with having even limited access, even just knowing when my cadets are next eligible to promote without consulting various squadron newspapers to see when they last promoted would be nice. Completely agreed, making things especially hard for cadet command staff, without this knowledge it makes motivating more difficult and tracking progress a near impossibility. I understand restricting it, however, cadet staff and duty positions should be allowed special access into the system. Or in its place there should be a cadet portion to this with the addition of restrictions set by the squadron commander (senior). I think I can sympathize with this cadet. How can it be expected that "cadets mentor junior cadets" when they do not have that info? Thank you for informing me! I'll ask my CC about that and hopefully get my request sent up the chain. Thank you, I have had this brought up many times currently, and serving on that staff, asking every one of 50+ cadets about progress and remembering all the answers is difficult. Having restricted and controlled access is needed, but there needs to be exceptions brought down. And perhaps this issue should be brought up via CAC? Even if the access was restricted to C/CC and Deputy CC they could pass it down to the other cadet staff members. Just possibility for improvement here? 50+ cadets exceeds the span of control any cadet should have. Thank you for your input on this, yes, these are delegated conversations, however, it is still difficult to keep track of. Having those reports still passed up chain of command is difficult as well having this system would make things easier. My intent wasn't to say that it was up to one cadet or another, it was to point out the error in trying to remember answers from all the cadet staff about all of their cadets. Well, there's the good olde CAPF 66, like we used when I was a cadet, or, more 21st century-ish, a simple spreadsheet. It's not as simple or efficient as an eServices report, but it works. On a more serious note, you might ask the SM Admin or Personnel Officer to print out reports for you before the meeting. I go through phase I and II promotion accomplishments and what is needed to complete the achievement requirements nearly every week and send it to our cadet staff. I think that should be done by the Deputy Commander for Cadets or another senior. Thank you for the input here, we could always use the CAPF 66, I suppose just frustrating that the misuse of some may have led to a less efficient method of tracking. I will bring that up as that is always a possibility and would be handy for the cadet staff to have. We could create a spreadsheet but this still doesn't eliminate the fact that we would have to ask each cadet (which often do not know what they need), however, we do what we have to do! Thank you for the ideas, I will definitely make use of them! Again thank you for the input, I appreciate the various ideas put out there, and we will definitely have a discussion about various methods with the staff. I think it is a good thing that this topic is brought up and discussed and various alternatives are mentioned. I do question the harm/benefit on the removal of all access to the systems that were, however, I also understand the reasoning behind it. I think that the option for approval should still be there for cadets so approved cadets could view, however, there are valid claims for and against all of the before/aftermentioned. Thank you again! Some members on this service praise doing away with paper trails and extol NHQ having online records yet when cadets ask for the same access when the info was on paper, they are told "no way, go back to paper." Why the inconsistency? Those same senior members telling these cadets "use paper" should also say "you are right, you should have online access." If there is concern for misuse of this info, then require a password. This thread is making me feel ! ? ! ? ! ? I think because the old CAPWATCH literally gave anyone who downloaded the text files almost everything about any member in your unit that was recorded in eServices. I can understand why people are uneasy because of how it was in the past, but I don't think it would be a problem now, provided only approved cadets access the system, and even then, with heavy limits on the info they could access. This doesn't happen for us, as of right now anyway. We will need to discuss this with our senior leadership. We are working on it. Currently, our chain of command isn't the most efficient due to cadet staff having school commitments etc making them unable to attend. The fact that our cadets aren't very consistent when it comes to attending often puts us in a position where there may only be a few cadet staff present and 30 ish cadets. With full staff attendance, it works out well. Unfortunately, that is the exception rather than the norm currently, which will hopefully be less of an issue when the school term ends. A spreadsheet works, but as you said, it isn't overly efficient. We will be meeting with our senior leadership to figure out access to records.